According to the latest market study by International Data Corporation (IDC), Google Android and Apple iOS accounted for 96.3 percent of all smartphone shipments -- that's up slightly from 95.6 percent in 4Q13. In terms of year-over-year shipment growth, Android outpaced the overall smartphone market for 2014 (32.0 percent vs 27.7 percent, respectively) while iOS beat the market in 4Q14 (46.1 percent vs 29.2 percent, respectively). "Many of the same drivers were in play for Android and iOS to tighten their grip on the market," said Ramon Llamas, research manager at IDC. "A combination of strong end-user demand, refreshed product portfolios, and the availability of low-cost devices – particularly for Android – drove volumes higher." 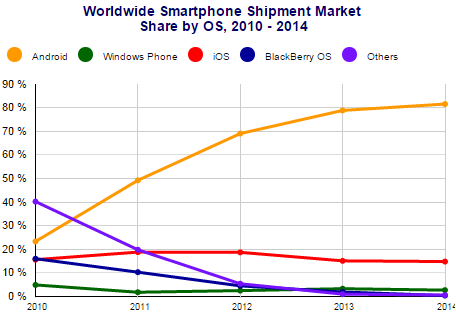 What will bear close observation is how the two operating systems fare in 2015 and beyond. Now that Apple has entered the phablet market, there are few new opportunities for the company to address. Meanwhile, Samsung experienced flat growth in 2014, forcing Android to rely more heavily on smaller vendors to drive volumes higher. Google Android pushed past the one billion unit mark in 2014, a significant milestone by itself but also because total Android volumes in 2014 bested total smartphone volumes in 2013. Samsung retained the leadership position by a wide margin, shipping more Android volume than the next five vendors combined. Apple iOS saw its market share for 2014 decline slightly, even as volumes reached a new record and grew at nearly the same pace as the overall smartphone market. Much of this was due to the strong demand for Apple's new and larger iPhones and the reception they had within key markets. Windows Phone had the smallest year-over-year increase among the leading operating systems growing just 4.2 percent, well below the overall market. Having finalized its acquisition of Nokia in the spring of 2014, Microsoft relied primarily on a long list of entry-level Lumia devices to maintain its position in the market. BlackBerry posted the only year-over-year decline among the leading operating systems -- falling -69.8 percent from 2013 levels. Moreover, 2014 marked a year of rationalization for the beleaguered platform, and revealed multiple enhancements to its platform and new device additions.